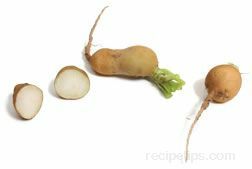 A large round root vegetable related to the turnip and horseradish family, with a crisp texture and a mild to sweet peppery flavor. Unlike many other radishes, the intensity of this radish decreases as the radish matures. Generally, the flesh of this radish is hotter toward the outside and sweeter toward the center. The Watermelon radish grows to approximately three inches in diameter, displaying a white outer skin at the top with green shoulders and a pink base that covers a bright red to magenta inner flesh. 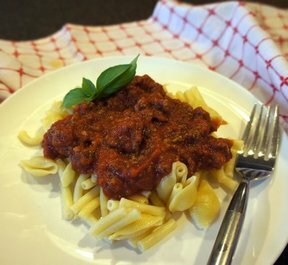 There are two main categories of radishes commonly known as either spring or winter radishes. The category of each is determined by their growing season and when they are harvested. 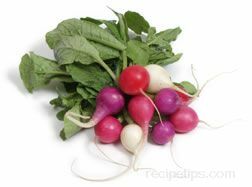 Spring radishes are harvested early in their growing season resulting in a smaller radish. The winter radishes are harvested later in their growth and result in a larger round or more elongated shaped vegetable. The Watermelon radish is considered to be a spring radish, but may be available throughout the year. This radish can be cooked like a turnip, creamed and served as a side dish, sautéed and braised to be served as a vegetable dish, or added to stir-fry dishes. The skin can be removed prior to preparing. 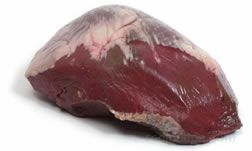 It can also be served raw to be used as hors d'oeuvres, as a complement to salads and sandwiches or diced for use in soups and stews. 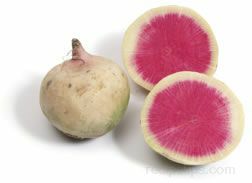 The color of the inner flesh makes it an attractive sliced radish for an appetizer tray or for sandwiches. When selecting, choose radishes that are firm, crisp, and without blemishes. Radishes grown and harvested when temperatures remain hot, develop an increased bitterness. Store without the leafy tops and place in the refrigerator, wrapped in plastic to keep fresh for several weeks. This radish may also be referred to a Beauty Heart, Rose Heart, Shinrimei, Misato, Asian Red Meat, or Xin Li Mei radish.